Las Alegrias is a spacious, thoughtfully renovated villa. With 4-5 beds/5 bath/1-2 living-rooms it offers contemporary fixtures and fittings; sturdy, handsome furniture; v.well equipped kitchen; 2 fridge-freezers. Webber Gas and charcoal BBQs. WiFi/Sat TV using Android/DVD. Extensive, comprehensive Library. Darts/Games. Large walled/private/gated/terraced swimming-pool - children friendly. Tiled dining table, lots of loungers and chairs, all with cushions. Choices of sunbathing/shade/dining areas. Sun terrace with dining table for 10 swing-seat and comfy seating. Hammock with shading in garden. Upstairs terrace. Plenty of space throughout house and garden to spread yourselves out. The air quality is superb. Explore valley river-beds and stunning mountain passes with glorious views. Birds galore. Elusive Mountain Ibex. Walking, biking, pony/horse-trekking. Visit whitewashed, cobbled, Alpujarran Moorish villages. Taste local tapas and wines in the areas' amazing choice of bars/restaurants. Golf courses are easily accessible. 40 mins north lies terrific site-seeing and shopping in Granada, with its unmissable Alhambra Palace and the ski resort above on the highest Spanish mountain range, the Sierra Nevada. 30 mins south lies the Costa Tropical with beaches ranging from secluded coves to large resorts. Las Alegrias is an idyllic place to enjoy a superbly relaxing holiday. We have worked over the last 14 years to create somewhere you can thoroughly enjoy. We have a delightful Spanish couple looking after the house. Sergio has created a lovely garden and ensures the swimming pool is sparklingly clean. His wife Celia creates a neat, tidy and clean environment for you to feel at home in as soon as you arrive. She buys you a welcome 'pack' of eggs, bread, butter, milk, water, beer and wine so there will be one meal for you in case you arrive after shops have closed. On the wide terrace around the crystal clear, private swimming pool are comfortable loungers, a dining table and lots of chairs. The views all around you are both magnificent and delightful. You can gently swing on the hammock shaded by a cane awning whilst drifting into an after lunch doze, with the sounds of the countryside as your lullaby. To save you having to drive, you are in walking distance (2 minutes) from two good restaurants where you can have a drink and tapas, order a take-away, or sit and relax with a delicious meal. This makes your life very easy if you don't want to bother cooking or BBQing. Alternatively, a 5 minute drive, or 15 minute stroll up to Orgiva town allows you a large choice of cafes, restaurants and tapas bars. Hello. I am Caroline married to David. David is retired editor/journalist with the Racing Post and I'm a psychotherapist. I love creating comfort with a bit of style in our home and spent pleasurable times seeking out things to enhance it . David is passionate about music, especially classical and jazz. We both love reading. The villa has a large, diverse library of books, CDs and DVDs. We live in a cottage in Hampshire overlooking fields with horses and pheasants roaming around. We have a cat called Fred. When I was 53 I fell ill and we decided that, should I be unable to work, we needed to think about how to fund ourselves without my financial input. So we decided to buy somewhere nice for ourselves to enjoy and to rent out. One year later I was well again and we had found these wonderful Alpujarran mountains in Andalucia. Soon after we bought a ruin on a large plot of land. Now we have a villa. When deciding what we wanted, we knew that the area would have to have lovely bright blue skies, plenty of sunshine especially in the winter. We have tested out the weather more recently in October, November and March and have enjoyed fabulous wall to wall sunshine. The walks are many and various, from easy to extreme!! Wherever you are the views are gorgeous. We found the Alpujarra region because David read 'South from Granada' by Gerald Brenan and then I read 'Driving Over Lemons' by Chris Stewart (our well known local author). Both authors evoked a magical, mountainous terrain mingled with fascinating Spanish culture and history. All of this we found, and more. Why did we buy this particular plot? The rural location, walkable into Orgiva, the wonderful smell of orange blossom, the spectacular uninterrupted mountain views, the peacefulness and, in particular, the opportunity to create something from scratch. We also love being equidistant from the coast and Granada's Alhambra Palace (35 kms). Las Alegrias is 5 minutes drive and 15 minutes walk from Orgiva. You can drive almost anywhere you want for holiday experiences within half to one hour. Golf, tennis, seaside, theme parks, historical monuments, wonderful restaurants/tapas bars, skiing in the winter, walking, riding, biking, mountaineering. Or you can stay put at the villa and completely relax sunbathing, swimming or if you prefer to sit in shady spots, there is plenty of choice. The villa has thick walls making it cool inside in the summer and warm in the winter. We offer a spacious, comfortable, modern interior with good quality, strong, comfortable furniture. We don't pretend to be ultra fashionable, we want our place to be easy to use. Our very helpful house manager is always available to help you. Aubergine: ensuite/bath/shower/bidet/basin/wc. Aquamarine: ensuite/shower/basin/wc. Avocado/Apricot: share main bath/shower over/bidet/basin/wc. Downstairs Hallway: Sep. shower-room/basin/wc/storage cupboard. Upstairs: shower-room/basin/wc. Downstairs: open-plan sitting-rm to kitchen/diner, leads out to large dining terrace/shade. Upstairs: large sit-rm + dble sofabed, dining table, shower/WC, and large terrace/shade. Comfortable sofas and chairs. WiFi/Sat TV/DVD. Fans. Wood burner. Modern v.well equipped kitchen, granite tops, range oven/grill/four hob burners, microwave, 2 large fridge/freezers, dishwasher, kettle, toaster, juicer, blender, Magimix, coffee makers, ample pots, pans, casseroles, crockery, cutlery, utensils, glasses. Terrace dining seats 10. Kitchen table seats 6. Upstairs table seats 6. The Sierra Nevada ski resort above Granada is the most southern in Europe and some 4700 metres above sea level, the highest peaks in Spain. The snow is excellent from December to March and often into April, and the slopes are extremely well cared for. The Spanish are very proud of this resort. It is a buzzing place with lots of activities other than skiing and snowboarding. Numerous pistes offer learner to advanced slopes for skiing, snowboarding and many other forms of activities. There is a good choice of restaurants, cafes and clubs. It takes about 60 minutes from the villa and you can hire chains if needs be. There are a number of golf courses within 30 minutes drive from the villa. There are also theme parks and water parks, zoos and botanical gardens all within 20-45 minutes drive. Tennis courts are available in Orgiva town. You can also go horse riding, pony trekking, mountain and quad biking, and paragliding. This is a lovely area for walkers with well-signposted routes through the hills, mountains, forests and over river beds. For the serious walker there are two famous long-distance paths that cross La Alpujarra. One is the GR-7 which begins in Tarifa in Cadiz Province and crosses Europe to Greece. The other is the GR-142 which runs from Lanjaron (10 minutes from Ogiva) to Finana on the northern side of the Sierra Nevada in Almeria Province. If you want to really exert yourself the highest mountain in Spain (Mulhacen) and its equally high neighbour (Veleta) can be conquered by foot in about three hours, starting from the Mirador de Trevelez. Notes on accommodation: All rooms enjoy lovely views to the mountains. Floors are tiled throughout. All rooms have fans. Upstairs: 2nd sitting-room (or bed 5)+ensuite shower-room; large terrace. Food pack of milk, bread, butter, eggs, water, beer and wine will welcome you. If you would like other food bought for your arrival, please contact caroline before you travel. Restaurants are open in Orgiva on sunday. Normally shops close on Sundays. There is a comprehensive information folder in the villa. From November to February it is often clear and sunny between 10.00-17.00 hours, but you will need a sweater/jacket at night and heavier clothing if you go up the mountains. For the cooler months the villa is electrically heated and has a large wood burner in the downstairs living-rm (logs provided). Duvets and blankets in every bedroom. The bunk beds (2 singles one above the other) are sturdy, suitable for adults and children, with deep, comfortable matresses. We like comfort ourselves and we stay here often. Outside: Main terrace has dining table (seats 10) Webber gas+charcoal BBQs, comfy armchairs/sofa; coffee table; shade and swing chair. Paved path leads to private, walled/gated swimming-pool 12m x 5m, depth from 1.5m to 2m. Cleaned weekly, its cleanliness benefits from guests using poolside shower before swimming. Spacious, non-slip terracing surrounds pool with shaded dining area, table+chairs. Plenty of sun loungers (plus cushions). Lights around and inside the pool for night time dining/swimming. Sun warms the water very well from April-October. The owner has swum in February. A large selection of melamine/plastic dining/drink-ware is available to avoid breakages by the pool. Landscaped front garden has a variety of flowering shrubs, bougainvillea, lavendar, herbs and wood-store. The rear garden is unlandscaped with orange, olive and almond trees, grapevines and laid mainly to grass. Large car parking area and shaded car-port for 2 cars. Solar panels heat water in house. Utility Room: Large Cupboard in downstairs shower-room/WC houses clothers dryers, soap powder, cleaning materials, hoover, iron and ironing board. An internal courtyard, open to sky, offers complete privacy, houses washing machine to keep noise away from main house. Cleaning / Towels / Linen / Maid service: Linen/bath/hand towels provided - changed weekly if required. Pool cleaned weekly at agreed time. Cleaning service provided at 10 euros per hour. Please call the House Manager to arrange whatever you require. Cot/high chair provided on request. Other: Smoke alarms throughout. Woodburner+electric heating. One beach-towel provided per person for the holiday. Fly screens/shutters. Darts board. Pub football game. Welcome food pack: Eggs, bread, butter, milk, water, wine, beer. All shops closed on Sunday. We stayed here at Las Alegrias as a family of 8. It suited us perfectly. There is oodles of space, room for privacy, room for family meals; the house is equipped with everything you need and more. The pool is gated - so perfect if you have small children. Everything is spotlessly clean, the garden and pool are fastidiously kept by Sergio who with his wife Celia are on hand and responded with huge good humour to our requests. Don't hesitate. Book it now! The villa is lovely, with an unbeatable view! 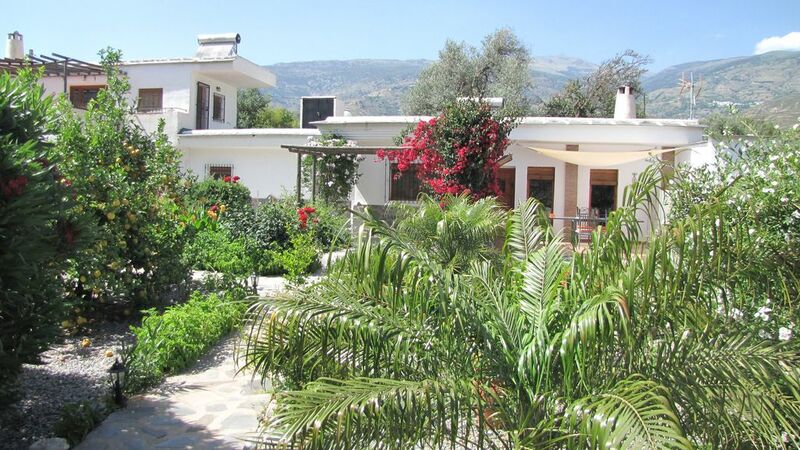 The gated swimming pool sits within a pretty garden looking at the mountains beyond. The walking nearby is stunning, with paths through typical white villages and into (sometimes steep) hills. Many thanks to the owners for providing such a comfortable and beautiful place to stay. Great time in Orgiva house ! We had a such nice time in this warmfull house ! It was like home but with the sun, the wonderfull landscape and the swimmingpool ! :-) The owners are very charming ! Don't hesitate a minut to rent it ! Thank you very much indeed for your kind words. We are delighted that you and your family enjoyed your stay and hope that you will all return next year. Peace nestled in beaut​i​ful fr​a​grant garden. ​On arrival we were struck by the beauty and privacy of the garden and the scent of summer herbs wafting towards us from the kitchen garden in the court yard, which also contains a lemon tree bursting with massive fruit, perfect for a Gin and Tonic by the pool (which was kept beautifully clean). All the rooms were spotless. We took our 4 month old baby girl, so asked the owners if they could provide a cot and a fan. They provided two different sized cots and fans so baby was happy. The only suggestion for improvement would be a slightly larger double bed in our room, however the beds in the others' rooms all looked to be a very good size. The views from the house were great and the best was the view from the dining room table on the patio (or cortijo, as they say out there) of the surrounding mountains. We particularly enjoyed our trip into the local town to the big Thursday market to buy huge sweet ripe peaches (that you just don't find in the UK) and beautiful almonds too. I would definitely recommend staying here and we would love to return some day. Las Alegrias, a beautifull house and garden! As a family with four teenages girls we enjoyed staying for a week in Las Alegrias. A spacious house with stunning garden and pool. The girls enjoyed the pool, the parents the threes to relax in the shade as July is rather hot!. Nice surrounding mountains. For a longer hike you have to get a bit higher up, which is only 30 min. by car. Excellent location, 15 mins walk up a quiet lane into town. Very well equipped villa with modern kitchen and everything you need and more. Lots of local information and maps. Pool is tremendous and we didn't venture far from it, you're not overlooked and it has a stunning view of the hills so you can easily while away the day splashing around and achieving very little. Sergio who looks after the pool and the beautiful grounds is very friendly and unobtrusive. The layout of the house is quirky and we did a bit of bedroom swapping before we settled on the right arrangement for us but there's lots of beds and lots of space so you won't struggle. Don't take up suitcase space with books as the owners have the most incredible number and range of books which you are welcome to borrow during your stay. Half an hour in the car to the beach at Salobrena which is lovely. Restaurants in town are friendly and the food is good, the pizza place with the orange trees is fab, excellent food and very friendly staff. Very relaxing stay, the goats wander up the lane regularly and it was lovely to listen to the goat bells clanging as they passed. 30 minutes south is the Costa Tropical offering a wide variety of secluded beaches and lovely resorts like Salobrena, Almunecar and La Herradura. Many activities: water and theme parks, sailing, water skiing, boat hire, wind surfing, fishing and scuba diving. Loads of beach sun-bed/picnic areas. Enjoy fresh fish of the day at numerous beach cafes. Shopping centers abound with latest international fashions. Driving from Bilbao would take 8 hrs; from Madrid 4-5 hrs. Otherwise hire a car at Malaga (80 mins) or Granada (35mins) airports. Motorways are excellent; views spectacular. 'A' roads are good; 'B' roads can be twisty but you don't need a 4-wheel-drive. A single track tarmac road leads from main road to the villa. Orgiva is a 5 minute drive, however we often walk it (15 mins) taking a torch at night. Off-tarmac mountain roads need a 4-wheel drive. Malaga airport is 80 minutes drive. Orgiva market town is 5 minutes drive and 15 minutes walk. The coast, Costa Tropical, is 30 minutes drive. The water theme park in Salobrena is 40 mins drive. Granada and its airport are 35 mins drive. The Alhambra Palace is 30 minutes drive. Granada ski resort is 60 mins drive (good road). Bubion 30 mins. See all the beautiful Alpujarran mountain villages within a day. Spaghetti Westerns' film-set and theme park: 2 hours drive. Good bus service from Orgiva. When arriving at Malaga Airport on a Saturday it is a good idea to stock up on food and supplies as shops in Orgiva are closed on Sunday - we will give you directions to a very good superstore called Al Campo in Motril - it is worth visiting before taking the road north toward Orgiva/Granada. Orgiva market town is packed full of small supermarkets, individual food/beverage shops, restaurants, cafes and tapas bars. Luckily you will more often than not be given free tapas when you drink at a bar - this habit seems to be dwindling in other areas of Spain. The market every Thursday morning sells fresh fruit, vegetables, herbs, spices, shoes, bags, clothes and jewellery (amongst many other things). There are numerous banks (open 9am-2pm) and ATMs. Orgiva is the main market town in Las Alpujarras and has been made famous in three books by our local author, Chris Stewart: 'Driving Over Lemons', 'A Parrot in a Pear Tree' and 'The Almond Appreciation Society'. All in our comprehensive library. WiFi installed at villa. The nearby town of Lanjaron bottles its wonderful spring water and houses a Balneario (spa) where you be pampered with massage or other treatments. The mountain villages of Pampaneira, Bubion and Capileira take 30 minutes to reach and are beautiful. Jazz or flamenco are often advertised locally. If a saint's day falls during your stay there may well be a fiesta which always includes fireworks, eating, drinking, dancing and singing in the streets. Spanish children stay up late to enjoy the fun with their families. Malaga is the airport of choice (80 minutes) as there are so many different flights, and the drive to Orgiva is easy with some spectacular sea and mountain views on the way. If you are lucky enough to find a flight into Granada, it is our nearest airport (40 minutes).